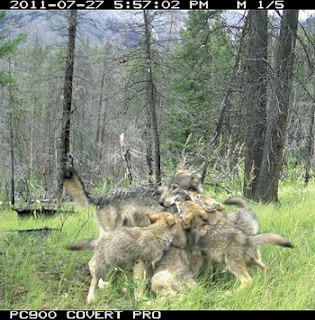 Motion-activated remote cameras are capturing images of wildlife throughout the southern Rockies of Alberta and B.C. and researchers hope they give them some answers on wildlife behaviour, movement and distribution over a large landscape. With no one actually behind remote battery-operated cameras, these images offer a rare and privileged view of wild animals going about their everyday lives. Every time something passes the camera’s infrared beam, an image is taken. This year marks the third year of the remote camera wildlife monitoring program in Banff, but it’s now being extended to include Jasper, Waterton Lakes, Yoho and Kootenay national parks, as well as provincial lands in Kananaskis Country. Wildlife officials say they are excited about the multi-jurisdictional pilot project because they can potentially use this non-invasive and relatively low cost method to monitor several wildlife species and human use across a study area of more than 40,000 square kilometres. “We realized we were all putting out remote cameras for different reasons and not working together at all and so we all got together to work collaboratively,” said Jesse Whittington, a wildlife biologist for Banff National Park. Approximately 42 motion-activated cameras are mounted on trees or encased in rock cairns along hiking and game trails throughout the 6,500 square-kilometre Banff National Park. The larger-scale project has 40 cameras in Jasper, 20 in Yoho and Kootenay and about 40 in Waterton Lakes. There are also about 20 cameras on provincial lands in Kananaskis Country. All parks are involved with setting up and servicing cameras, classifying photos, and participating in discussions on how to proceed with analysis and future sampling. Robin Steenweg, from the University of Montana, will analyse the data and come up with recommendations on the best sampling protocols to use and will conduct large-scale analysis on factors affecting species distributions. While the power of remote cameras lies in their ability to capture images from all species, this project is primarily interested in grizzly bears (including the number of females with cubs), wolverines and lynx, which are struggling in parts of the United States, and of which little is known here. Researchers also want to keep a close eye on species such as white-tailed deer, which could have potential wolf-mediated effects on caribou, and keep an eye on levels of human use on trails. So far, the cameras have recorded grizzly bears on 39 of the 42 cameras in Banff National Park, discovered wolverines are concentrating in the Cascade area and that lynx are scattered throughout the park. Parks Canada officials say they have been particularly surprised by the number of fox photos in Banff, noting very few staff have ever seen one in Banff National Park, which is a testament to the fox’s nocturnal and wily nature. Whittington said Parks Canada recently finished processing 130,000 images taken over the course of last summer. He said the cameras captured a family of three wolverines going over a pass in the south end of Banff National Park and recorded at least four grizzly bears using a rub tree in the Cascade area. But what Whittington found most interesting is that the Fairholme benchlands in the Bow Valley are proving to be a “huge hot spot for wildlife activity,” noting there were several grizzlies using the area last summer. “We have a female grizzly with a cub that we didn’t know about, and the Fairholme wolf pack denned up on the bench and had at least six pups, which we also didn’t know about,” he said. Whittington said researchers have been surprised at how well the remote cameras have worked for wolf monitoring, given wolf packs are very dynamic and their numbers and range can change considerably each year. “The cameras work well because we can determine the minimum number and colours of wolves within each area and from that we can piece together how many wolves are in each wolf pack,” he said. Whittington said, similarly, wolf density can have large effects on caribou survival, which is important given Parks Canada is working towards a caribou translocation program in Jasper and/or Banff through captive rearing. He said most caribou herds require wolf densities of less than six wolves per 1,000 square kilometres. “For the last four years, we’ve had between two and three wolves per 1,000 square kilometres, which makes us think that conditions should be better for caribou survival,” he said. Whittington said the cameras also pick up human use activity, noting hardly any people were recorded going into the voluntary closure on the Fairholme bench at all, with the exception of Carrot Creek. He said the cameras may also help Parks monitor human use in the backcountry. “Knowing how many people use the backcountry in Banff will help us determine where to concentrate efforts for maintaining backcountry trails and how human use in the backcountry may be affecting wildlife,” he said.